The Wellington Cycle Co., was established in 1901 by Rustomjee Dorabjee Wellington (Anglicized from his Parsi name Rustomjee Dorabjee) assisted by T. Dorabjee and R. Dorabjee. The Wellington Cycle Co., had taken over premises at 1 Churchgate Street, Fort, Bombay, that had formerly been occupied by Watson & Co., General Merchants. The Proprietor, Rustomjee Dorabjee had established The Wellington Cycle Co., as Agents for the (English) ‘Rambler’ cycles and the West End Cycle Co., of London. Between 1901 and 1905 it seems that the firm was only dealing in cycles and cycle accessories. In 1904 a Mr. B. Dorabji also joined the firm – suggesting that the business was a family concern. 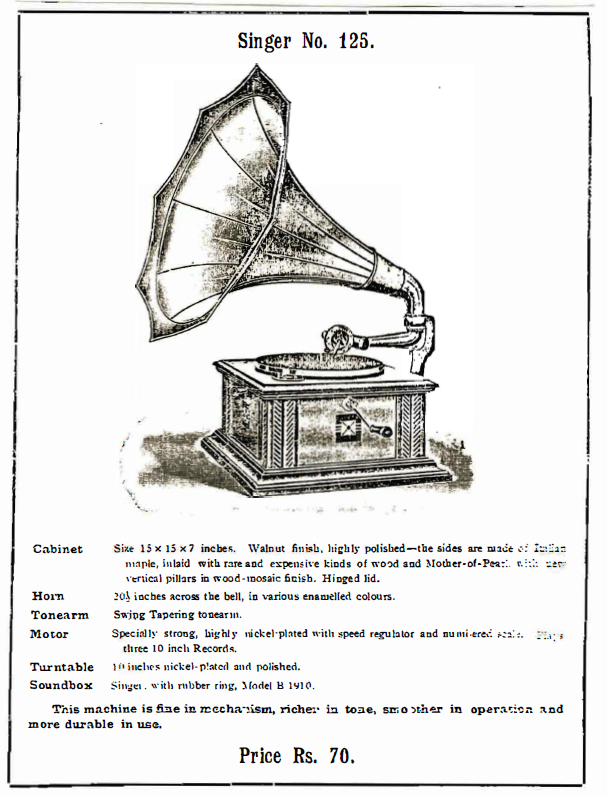 By mid-1905, rumors were circulating in Bombay that an Indian company was being set up to manufacture disc records, and that 300,000 rupees was put up to float the company, It was also rumored that a German recording expert was to reach Bombay in August to assist the Indian company with the recording and manufacture of the disc records. 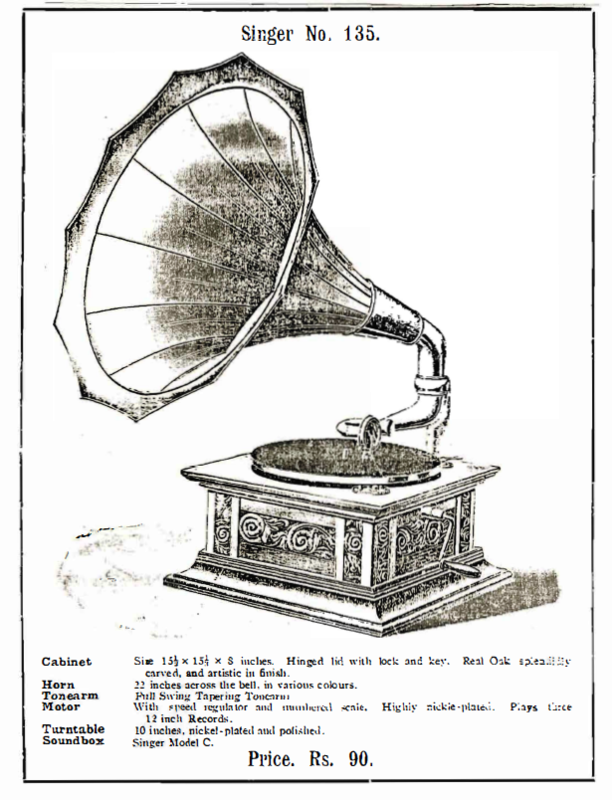 Examples of the disc to be manufactured were being shown to dealers in the trade, described as ‘MOZART-SCHALLPLATTE’ by the German recording expert enquiring about the making and viability of Indian repertoire – to be reproduced in Bombay. The application for trade mark registration of ‘MOZART-SCHALLPLATTE’ was lodged in Germany on 8 November 1904, and granted on 20 February 1905 — (No. 76671) to – Ambrion-Werke, G.m.b.R., of Pankow=Berlin, then an inner North-Eastern suburb of Berlin. It is not known if the Ambrion-Werke, G.m.b,H., actually manufactured their own disc record – had simply taken the recordings and had them manufactured by some other company. 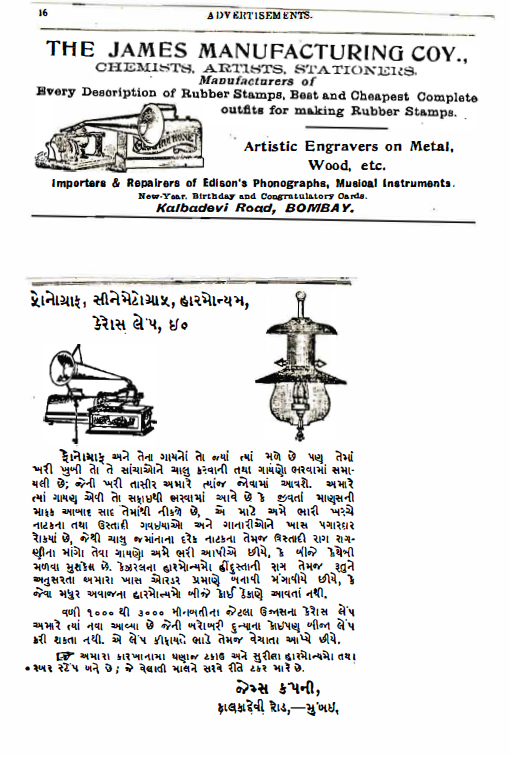 At first it was thought that the arrival of the German recording expert in Bombay was in advance of an up-coming recording expedition of the Beka Record, G.m.b.H., Berlin, which bad been organized in association with Valabhdas, Lakhmidas & Co., Bombay, who were the major distributors of ‘cylinder’ products and phonographs in Western India. Heinrich Bumb and Max Hadert, the recording experts of Beka Record, G.m.b.H., Berlin – arrived in Bombay during November 1905 and by January 1906 had taken some 330 recordings of Indian repertoire at Bombay and Calcutta, before continuing on to Burma. These ‘Beka’ recordings formed the beginning on the label’s Indian repertoire which was further enhanced by another ‘Beka’ recording tour of India from December 1906 into early 1907. 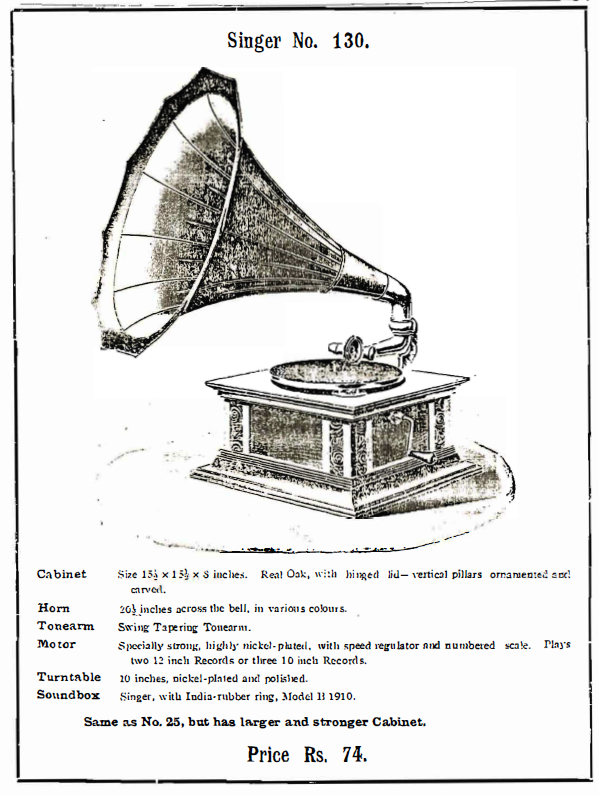 The addition of the ‘Beka’ recordings to the Indian market brought the number of major ‘disc record’ companies in India to three along with The Gramophone & Typewriter, Ltd., and Nicole Freres (India) Ltd.
By October 1907, there were reports circulating in the trade that another ‘Native Concern’ had completed the purchase of machinery and presses for the erection of a disc record manufacturing plant in a building which they bad rented in Kalbadevi Road, Bombay. The ‘Native Concern’ was soon identified as The Wellington Cycle Co., and that they had completed recordings to be issued under the names of the ‘Singer’ Record and the ‘James Opera Record’ – both to retail at Rs. 2/4/­ under an arrangement whereby – The Wellington Cycle Co., would distribute the ‘Singer’ Record, and The James Manufacturing Coy., would handle the ‘James Opera Record’. The James !lanufacturing Coy., had originally been established in 1885 in tbe name of S. James and Co., Chemists and General Uerchants, at 103 Kalbadevi Road, Bombay. By 1894, Hormasjee N. tlehta and Jivanjee D, Mehta had become t.he par-i:ners in the firm which was re-named in the title of The James Manufacturing Coy. Hormasjee N. Mehta and Jivanjee D. Mehta were joined in 1896 by by Nagardas V. Bhoota, who subsequently left the firm in 1898. The change in the name of the firm was also reflected in the expansion of it’s activities t.o manufacturers of rubber stamps, marking and engravinc requisites. 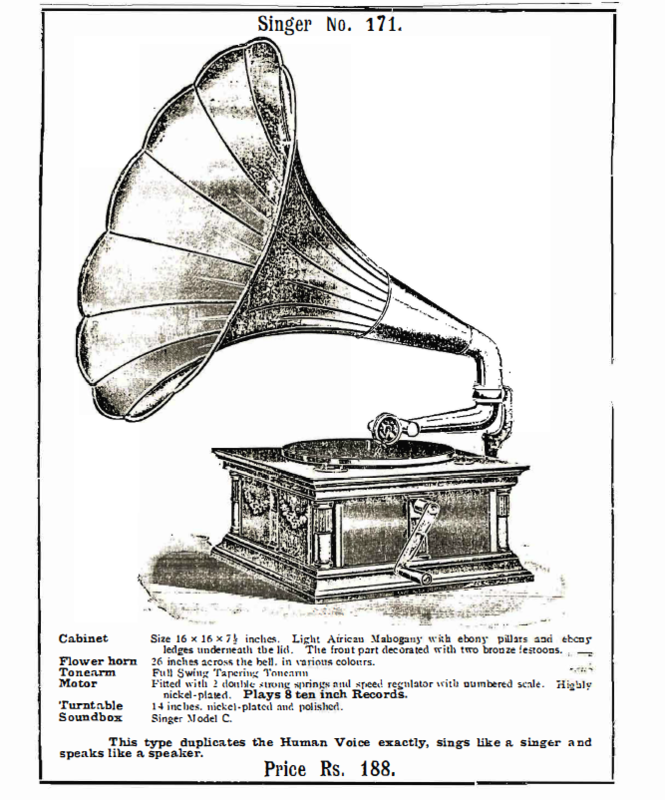 During 1903-04 the business was again expanded to include the sale of musical instruments and ‘Edison’ phonographs. By 1905 the firm had diversified even further to include the sale of cinematographs and incandescent. lamps. Although 103 Kalbadevi Road was t.he main retail outlet of the company, a warehouse and works was located at 115 Girgaum Road, Thakurdar, Bombay, managed by Dadabhai Rormasj ee Bilimoria. Reports were again circulating in the trade that. the promoter of The Wellington Cycle Co., was none other than Valabhdas, Lakhmidas &. Co., and that Valabbdas Runchordas had borrowed some 60,000 rupees from a relative in Calcutta to provide the machinery for the factory in Kalbadevi Road, and that company was being operated by a former employee of The Nicole Record Company, Ltd., and also that Miss Gauhar Jan of Calcutta had given the company 20 records of her voice. Valabhdas Runchordas may well have had a personal and financial interest in the development of The Wellington Cycle Co., as a disc record manufacturer since he had no disc record pressing facility of his own at the time. 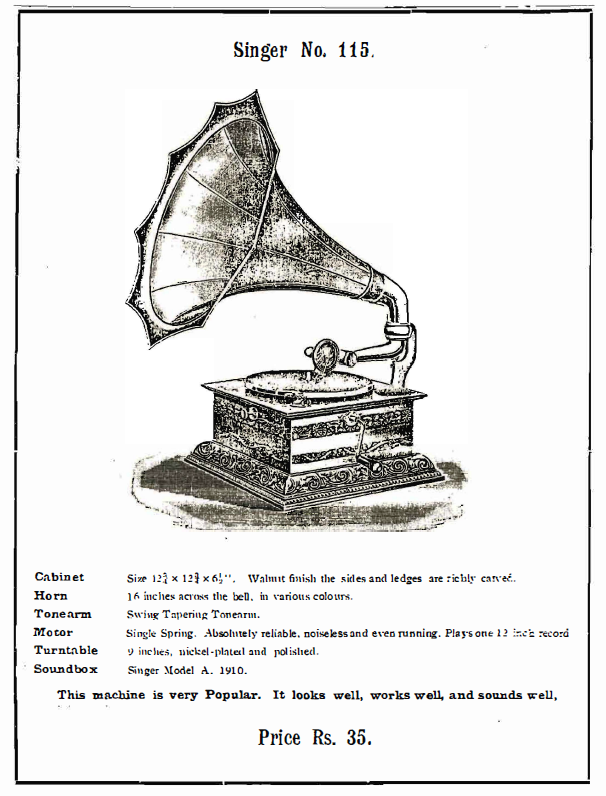 Valabhdas Runchordas – through his two companies – Valabhdas Lakhmidas & Co., and The Talking Machine and Indian Record Co., were the ‘sole monopolists’ in India for the ‘Beka Record’ and had for some time been a major distributor of ‘Gramophone’ products in Western India. 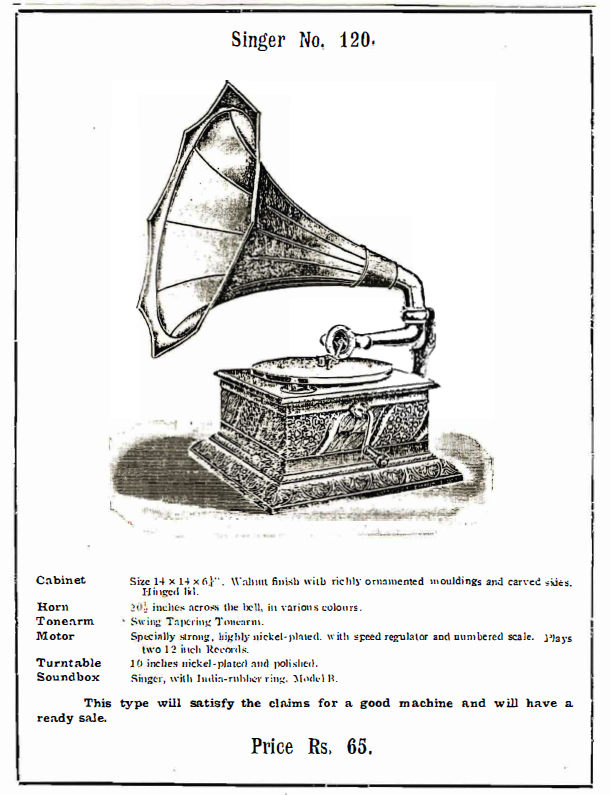 The distribution arrangement between The Gramophone & Typewriter, Ltd., and Valabhdas Runchordas was the subject of bitter legal wrangling between the t:wo parties, with each party attempting to control the market for sales of Indian recordings. It is most likely that the establishment of The Wellington Cycle Co,, as a disc record manufacturer was the outcome of a joint-venture between Rustomjee Dorabjee, Proprietor of The Wellington Cycle Co., and Hormusjee N. Hehta, the controlling partner of The James Manufacturing Coy. Sometime during early 1907, a store in the name of the Singer Phonograph Depot opened at 1 Churchgate Street, Fort, Bombay, and later the same year the name of The Wellington Cycle Co., was changed to The Wellington Cycle and Motor C., continuing to operate from 1 Churchgate Street. The change in the name of the finm was not reflected in it’s activities in the sound record industry in which it was still referred to as simply The Wellington Cycle Co. 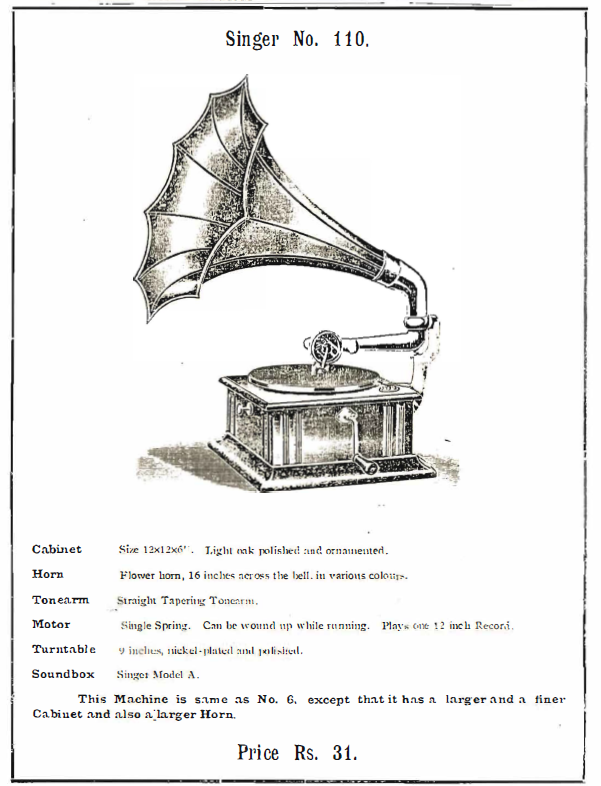 The James Manufacturing Coy., were prolific advertisers of the ‘Edison’ phonograph and ‘incandescent lamp’ – particularly in the Gujarati press, usually in the name of “James Company” Kalbadevi Road, Bombay. 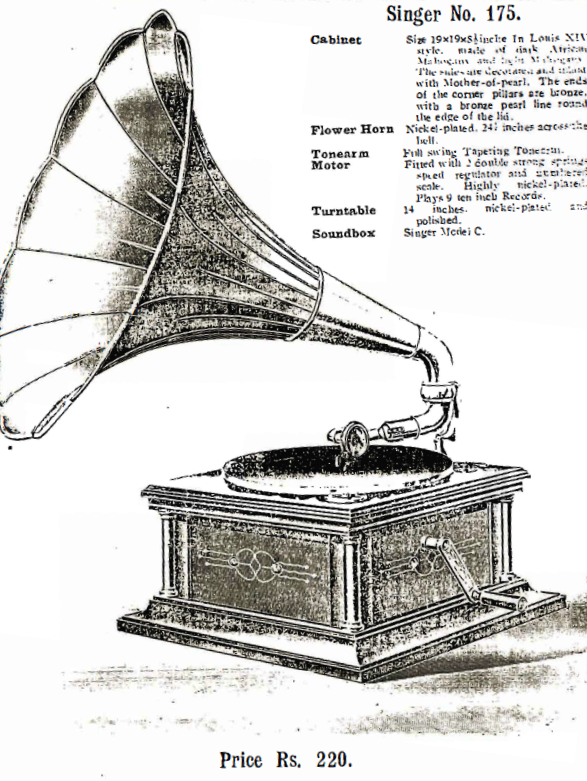 By 1907, the advertisements of “James Company” began to feature a talking machine identified as the ‘SINGER GRAMOPHONE’. 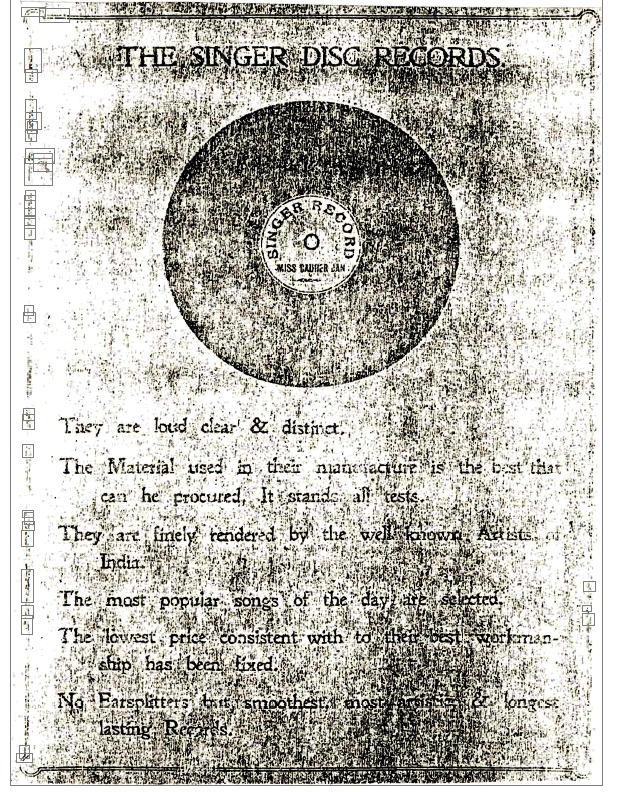 Evidence that The Wellington Cycle Co., had gone into production of disc records is supported by advertisements placed by The James Manufacturing Coy., in the Gujarati newspapers, ‘Bombay Samachar’ and ‘Jam-E-Jamshed’ from late 1907 into early 1908. During 1908, the Singer Phonograph Depot moved from 1 Churchgate Street, Fort, to 10 Kalbadevi Road, Bombay, and changed it’s name to the ‘Singer Talking Machine Depot’. At about the same time The James Manufacturing Coy., also increased it’s floor space by taking over the shop next door at 102 Kalbadevi Road, and operated the new store as the Edison Phonograph Agency, and it’s co-occupants included B. Ardeshir & Co., (another Edison Phonograph trader) and also the Singer Talking Machine Depot. The actual location of where The Wellington Cycle Co., had installed it’s disc recorcl pressing facility has not been discovered, however the factory was said to be operating – three hand presses – in rented rooms in the Kalbadevi Road, which suggests that 102 Kalbadevi Road, may have been the location of the factory. That The Wellington Cycle Co., might have placed the ‘SINGER RECORD’ on the market by late 1907 has not been revealed in any advertisements of the time, but there is no doubt that the ‘JAMES OPERA RECORD’ had been placed on the market by early 1908. The pressings of the ‘JAMES OPERA RECORD’ single-side recorded discs that have been examined – are of a rather rough finish – but have quite good sound. The catalogue numbering appears to have been started – at No. 1 – (with both the catalogue and matrix numbers being the same). Another complication to the suggestion that The Wellington Cycle Co., had pressed the ‘JAMES OPERA RECORD’ is that some single-side pressings have been printed with the wording – Matrix Made in Bombay – Pressed in Berlin”. It is most likely that these pressings were manufactured by Beka Record, G.m.b.H., Berlin, as the same wording is also printed on some of the very early single-side ‘BEKA GRAND RECORD’ issues. During 1908, Jivanjee D. Mehta died and Hormasjee N. Hehta was joined in partnership by Rustomji B. Lala, as proprietors of The James Manufacturing; Coy. but by early 1909, Rustomji B. Lala had severed his relationship with Hormasjee N, Mehta, who continued on as the Sole Proprietor of The James Manufacturing Coy., (and it’s subsidiary concern, James and Co., ) which at the time was describing itself as “Manufacturers of ‘Indian disc records’ – Harmoniums and Incandescent lamps”. The reason for the dissolution of the partnership between Hormusjee N. Mehta and Rustomji B. Lala is not known, and it may have been simply of a division of interests in regard to the disc record manufacturing aspect of the business – jointly conducted between The Wellington Cycle Co., and The James Manufacturing Coy. The Wellington Cycle & Motor Co., continued to conduct it’s business from 1 Churchgate Street, Fort, Bombay, but. whether it continued in the disc record business beyond 1909 is not known. By 1909, Rustomji B. Lala had gone into partnership with Nanabhoy J. Hody, and the business operating at 10 Kalbaclevi Roadi had changed it’s name from the Singer Talking Machine Depot to the – Singer Phono and Record Agency. The re-structuring of this business had also taken over the adjoining premises at number 12 Kalbadevi Road. As events unfolded – it appears that The Wellington Cycle Co., had ceased manufacturing disc record, and also that The James Manufacturing Coy., had taken over the machinery. Certainly The James Manufacturing Coy., had continued to issue ‘JAMES OPERA RECORD’ labelled discs at least up until 1910. The numbering of ‘JAMES OPERA RECORD’ disc records all single sided – indicate that some 1600 titles had been catalogued to the label. No examples of a single-side ‘SINGER RECORD’ – which appear to have been of Indian manufacture have been found, nor has any catalogue been found to verify the selections that may have been issued on the label. There are also grounds to believe that the ‘SINGER RECORD’ and the ‘JAMES OPERA RECORD’ shared the same numerical series, in that discs of some artists on one label bear close proximity to releases of the same artist on the other label. 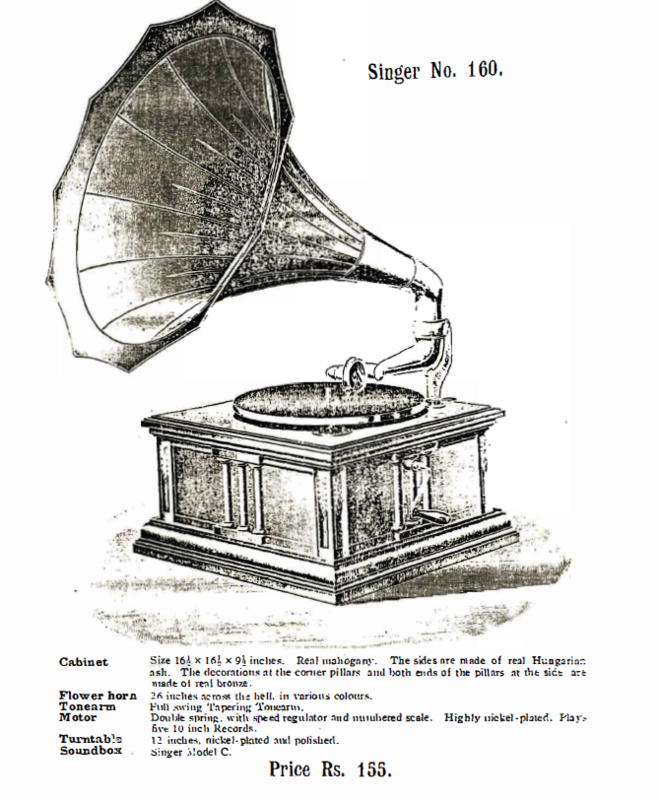 The re-structuring of the Singer Phonograph Depot (and Singer Talking Machine Depot) into the Singer Phono and Record Agency during 1909, may provide the positive clue to the reality that The Wellington Cycle Co., had ceased to function as a disc record factory in Bombay, and that the manufacture of tbe ‘SINGER RECORD’ had passed into the hands of a German company. On 5 AuGust 1909, Schallplatten=Fabrik “Favorite” G.m.b.H., of Hanover­-Linden , Germany, applied for the registration of a trade mark in the name of SINGER RECORD’ (with a ‘peacock’ trade mark). The application was granted on 22 July 1910, (No. 132543) for application to all classes and manner of disc records and talking machine products. 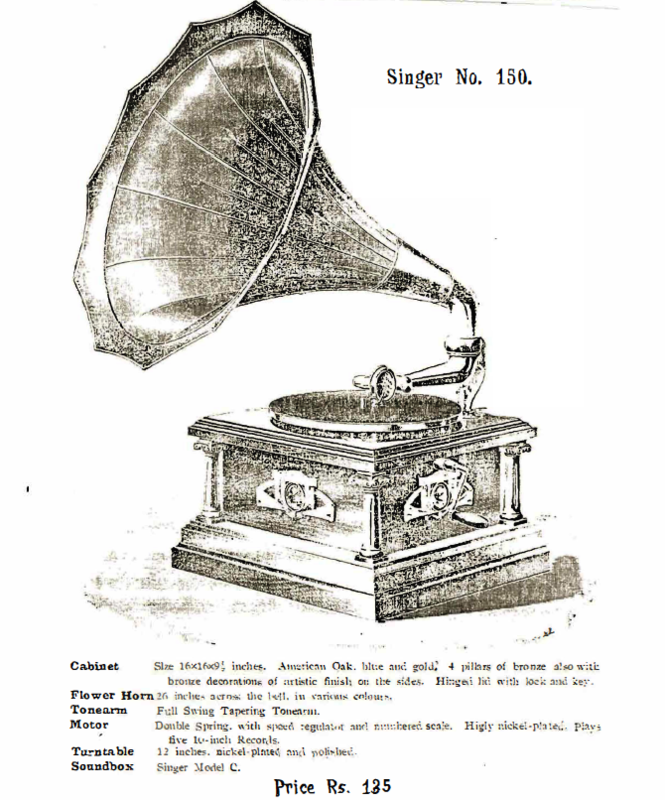 In 1910 a catalogue of disc talking machines and accessories was published by the Singer Phono and Record Agency, 10-12 Kalbadevi Road, Bombay. This talking machine catalogue gives the details and prices of several machines which are believed to have been manufactured by E. Paillard & Cie., Sainte Croix, Switzerland. 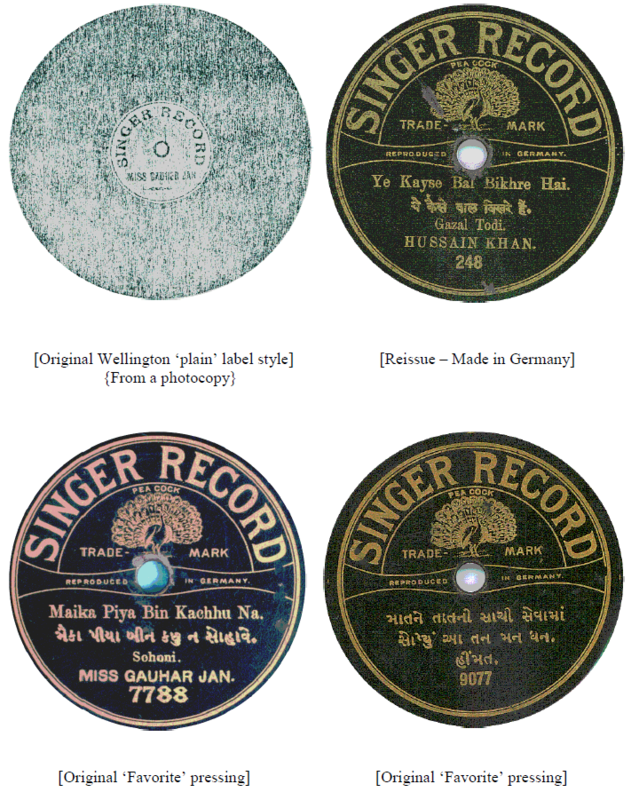 Although no examples have been found – (a couple of illustrations seen) – suggest that single-side recorded discs manufactured in Bombay by The Wellington Cycle Co., have simply the words – ‘SINGER RECORD’ printed around the top half of the label – (without the ‘Peacock’ trade mark – in black labels with gold printing. 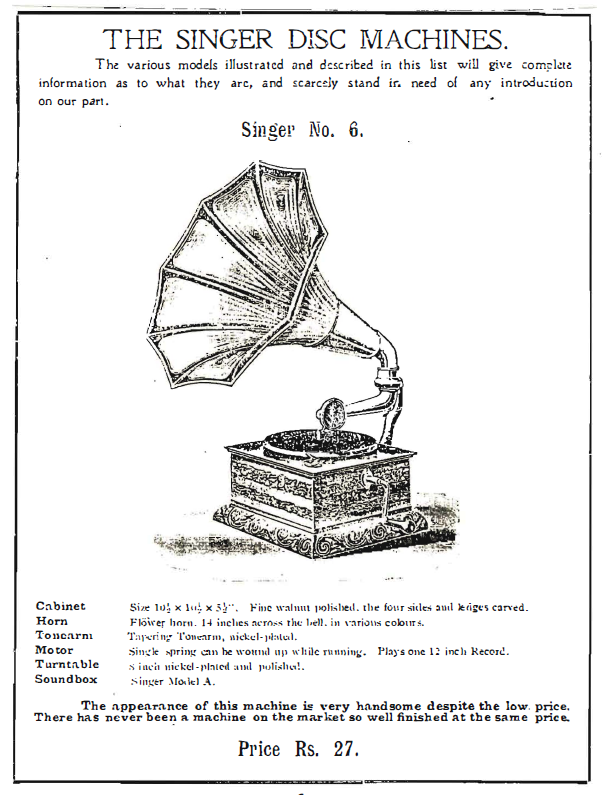 The talking machine catalogue of 1910 also includes a page devoted to the ‘SINGER RECORD’ but there is no evidence in the catalogue of the ‘Peacock’ trade mark. From all known examples of the “SINGER RECORD’ is seems that – ALL – of the earliest – “Favorite” pressings and releases were simply reissues – as double sided disc records – of titles that had formerly been manufactured by The Wellington Cycle Co.
What makes these reissues more interesting is the fact that – ALL – known examples of the ‘early” SINGER RECORD – have an Indian selection on one side and a French or English – selection on the reverse. All of the titles of Indian repertoire fit into the numerical system common to both the original ‘SINGER RECORD’ and the ‘JAMES OPERA RECORD’ – manufactured in Bombay by The Wellington Cycle Co. It seems that the numbering of the ‘JAMES OPERA RECORD’ had reached about 600 titles sometime during 1910, and along with the re-structure of the ‘SINGER RECORD’ (into a German registered trade mark) – The ‘JAMES OPERA RECORD’ appears to have been re-named the ‘JAMES OPERAPHONE RECORD’. It is also interesting to note that the telegraphic address of The James Manufacturing Coy., was changed from “James.Co” to “Operaphone” at about this time and tbat some advertisements of The James Manufacturing Co., Bombay, claim to be – Manufacturers of the ‘JAMES OPERA RECORD’. 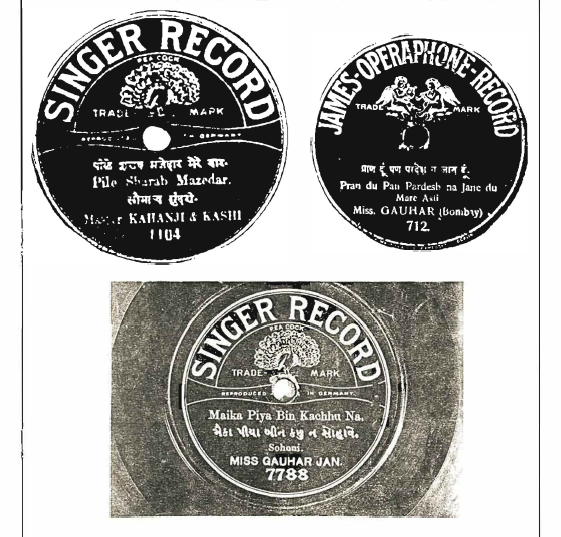 Although it is not known if the matrices and stampers used to manufacture the ‘JAMES OPERA RECORD’ or the later ‘JAMES OPERAPHONE RECORD’ were sent to Germany and the finish if the ‘James’ labelled discs suggests that they were all made in India. On the other hand the matrices and stampers of the ‘SINGER RECORD’ were sent to the Schallplatten=Fabrik “Favorite” G.m.b.H,, Hannover-Linden for reproduction. The re-organization of tbe Singer Phono & Record Agency, 10-12 Kalbadevi Road, in 1909, and the change in manufacturing the ‘SINGER RECORD’ from The Wellington Cycle., Co., Bombay – to Schallplatten=Fabrik “Favorite” G.m.b.H., Hannover-Linden, Germany, may have provided the Singer Phono & Record Agency with better quality pressings. At this point it seems that The Wiellington Cycle Co., ceased to have any direct association with the sound recording and disc pressing industry in India, although The Wellington Cycle & Motor Co., remained in business and eventually expanded it’s operations to branches in Poona and Bangalore in particular. ‘Schallplatten=Fabrik “Favorite” had it’s beginning in about 1898 as ‘Union, Commerce, G.f.P = B.m.b.H., (Patent holders), Charlottenstrasse-84, Berlin, which had been established to manufacture a variety of products including Phonographs, Graphophone, Cylinders, and other apparatus and also products made of Graphite and other forms. The products of ‘Union, Commerce, G.f,P=B.m.b.R,, were marketed under the brand names of ‘Union’ – Favorite’ – ‘Eagle’ and ‘Eden’. In 1904, Schallplatten=Fabrik, “Favorite” G.m.b.H., was established with it’s head office at Kurstrasse-51, Berlin, and with a factory located at Leinaustrasse 27, Hannover = Linden, an inner suburb of Hanover. In 1906 the head office was shifted to Ritterstrasse-86, Berlin S,42 – with Herr. A.H. Newman (the founder of the company) as the International General Representative. The company was financed by The Dresdener Bank, with Senator L. Fisher as the Chairman. The technical director and first recording expert was Otto Birkhahn. 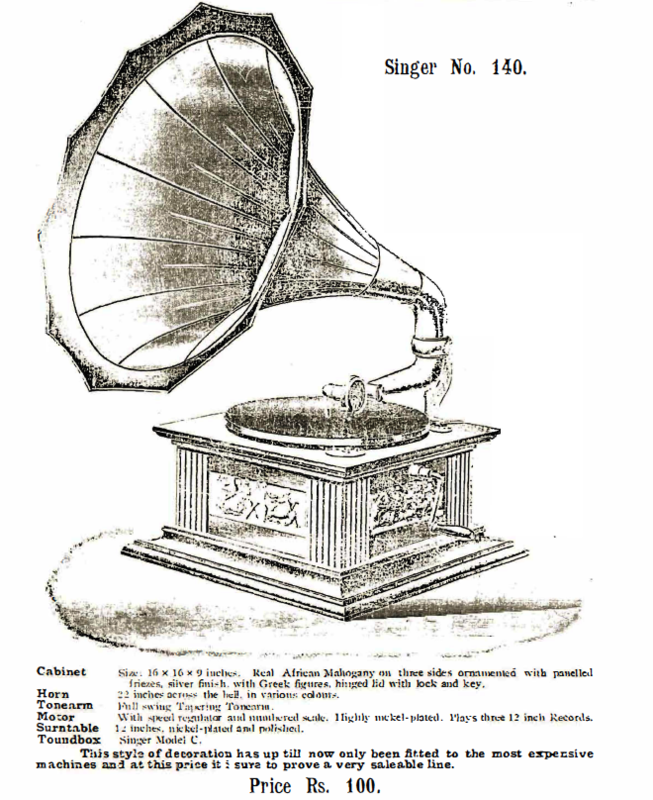 The re-organization of the “Favorite” company was primarily to enter the disc record and talking machine market and to this aim recording sessions had commenced in Germany and France during late 1904. The primary trade marks of the company were ‘EDEN’ and ‘FAVORITE’. By mid-1905 the company had extended it’s recording programs to Egypt, Greece, Turkey, for eastern repertoire and also to Stockholm, for Scandanavian selections. By 1908, ‘Favourite’ had several recording experts active in Europe, also in the mliddle East and Russia. There is no evidence that the ‘Favorite’ company undertook any recording tours of Asia or India, although their catalogues of Arabic, Greek and Turkish repertoires was quite substantial. Within the few years since it’s establishment in 1904, the ‘Favorite’ company had risen to become one of the most active and successful German record companies, and in October 1911, Scballplatten=Fabrik – Favorite, G.m.b.H., was converted into ‘Favorite Record’ Aktiengesellschaft (A.G.) with a capital of 1,200,000 German Marks, and re-structured it’s board which included Otto Birkhahn, of Hannover-Linden, and Kurt Bendix of Berlin. Although the ‘Favorite’ company had it’s own disc record factory at Hannover-Linden, the materials needed for the manufacture of the disc record was supplied by Grunbawm & Thomas, G.m.b.H., Berlin, who also had pressing plants at Warsaw in Poland, and also at Vienna, Austria. By late 1912, the disc record and talking machine market in Germany had reached a point of over-saturation, and the major companies in the sound recording industry faced diminishing profits and return on their heavily financed operations. A solution to the market situation was sought by the amalgamation or merger of a number of companies into larger and hopefully – more profitable conglomerates. The process of acquisitions and mergers actually goes back to about July 1910, with Beka Record, G.m.b.H., Berlin, being merged with Fritz Puppel, G.m.b.H., Berlin,(combining disc record and talking machine manufacturers) to form Beka Record, A.G., and a month later the reformed ‘Beka’ company was taken over by Carl Lindstrom, A.G., this was followed in July 1911, by the take-over of Fonotipia, Ltd., who were also the controllers of the International Talking Machine Co.m.b.H., who were responsible for the pressing of ‘ODEON RECORD’ and also the ‘BAIDA RECORD (BAIDAPHON) for Baida Cousins, Beyrouth, and the ‘ORFEON RECORD’ for Blumenthal Record and Talking Machine Co., Ltd., Constantinople and Cairo. – both of whom had extensive ‘oriental’ catalogues of recordings. Accepting the fact that The Wiellington Cycle Co., bad been manufacturing the ‘SINGER RECORD’ and that the Beka Record, G.m.b,H., Berlin had been providing The James Manufacturing Coy., with pressings of the ‘JAMES OPERA RECORD’ up to mid-1910, the – Beka Record – Fritz Puppel – being absorbed into the Carl Lindstrom, A.G. conglomerate – may have been the reason that The James Hanufacturing Coy., took over the disc record pressing plant from The Wellington Cycle Co., thus enabling them to continue marketing the ‘JAMES OPERA RECORD’. Other additions to the Carl Lindstrom, A.G., corporate structure included Lyrophon =werke, Adolf Leiban & Co., (converted to A.G.) recently having been merged with Da Capo Record, A.G., Grunbaum & Thomas, A.G., and the Favorite Record, A.G., which was merged into the Carl Lindstrom, A.G., conglomerate in December 1913. The effect of this process of acquisitions and mergers meant that the Carl Lindstrom, A.G., controlled and operated most of the important ‘european’ record labels – including ‘PARLOPHON’ – ‘ODEON’ – ‘BEIA’ – ‘FONOTIPIA’ ‘JUMBO’ – ‘LYROPHON’ – ‘DA CAPO’ – ‘FAVORITE’ – and (in regard to India) – ‘SINGER RECORD’ amongst several other subsidiary labels of the companies concerned. 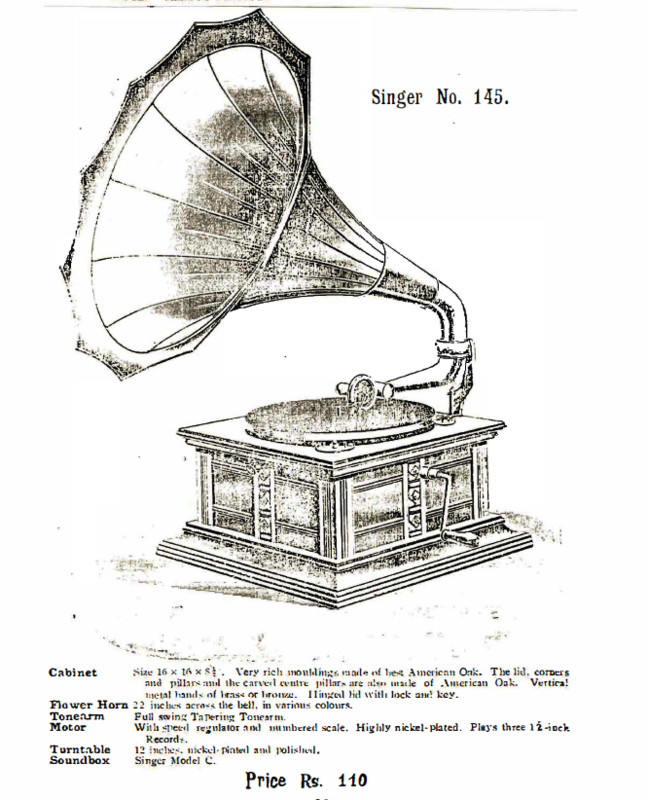 The ramifications of these mergers for India meant that at least the ‘SINGER RECORD’ (manufactured by Favorite Record, A.G.) had been taken into the ‘fold’ of Carl Lindstrom, A.G., Berlin – whose representative in India was Valabhdas Lakhmidas & Co., Bombay, who marketed the ‘BEKA RECORD’ and ‘ODEON RECORD’. That tbe ‘SINGER RECORD’ was included in this process of mergers, suggests that the – Singer Phono & Record Agency, 10-12 Kalbadevi Road, Bombay, (operated by Nanabhoy J, Mody and Rustomji B. Lala) may have had financial – or other support from Favorite Record, A.G., and that the Singer Phono & Record Agency – did not in fact have sole proprietory rights or ownership of the matrices of the ‘SINGER RECORD’. The situation with The James Manufacturing Co., appears to have been quite different – depending on who financed the recording sessions – copyright and manufacture of the repertoires on either ‘JAMES OPERA RECORD’ or the ‘SINGER RECORD’. lt seems that The James Manufacturing Co., continued to market the ‘JAMES OPERA RECORD’ – ‘JAMES OPERAPHONE RECORD’ up until 1913 at least. Since the ‘JAMES OPERA RECORD’ usually shows pressed in Berlin’ on the labels – it is most likely that the pressing plants of Max Thomas, A.G., were the source of the pressings. Early in 1914, Valabhdas Runcbordas, the senior partner of Valabhdas, Lakhmidas & Co., Bombay, and the manager of The Talking Machine and Indian Record Co., (Beka, Odeon, & Jumbo Record Agency), Fort, Bombay, travelled to Europe to acquire machinery for the purpose of setting up his own disc record factory in India. Another reason for his visit to Europe was that he had recently bought up the stock of the Singer Phono & Record Agency and hoped to obtain the matrices and stampers of the ‘SINGER RECORD’ with a view to pressing the repertoire – once his factory was operational. Valabhdas Runchordas had also recently established another company in the name of tbe Viel-o-phone Co., Ltd., with it’s head office at his bungalow, “Infinite” Mogul Lane, Mahim, Bombay. Sometime during 1913, Valabhdas Runchordas had taken on the agency for the English “EDISON BELL” label by arrangement with J.E. Hough, Ltd,, Edisonia Works, Glengall Road, London, S.E. J.E. Hough, Ltd., had pressed some of it’s own English selections for Valabhdas Runchordas, which were marketed in India with the label as the – “VIEL-0-PHONE” GRAND RECORD. The Sole proprietors for this label are given as The Talking Machine & Indian Record Co,, but have the ‘open palm’ trade mark which was registered to The Viel-o-phone Co., Ltd., Bombay. 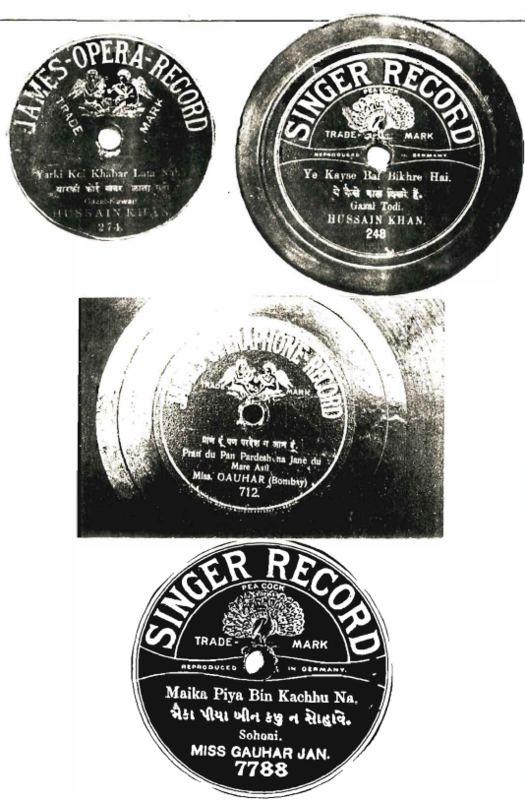 Some years earlier, in March 1908, The Talking Machine & Indian Record Co., Bombay, Calcutta, Delhi, Madras and Rangoon, had announced that the ‘PHON-0-PHONE’ Indian disc record was to be placed on the market. The titles that may have-been issued to start the ‘PHON-0-PHONE’ label are not known – but are believed to have been new releases or reissues from the matrix stocks of ‘BEKA GRAND RECORD’ selections and were manufactured in Berlin by Beka Record, G.m,b,H. 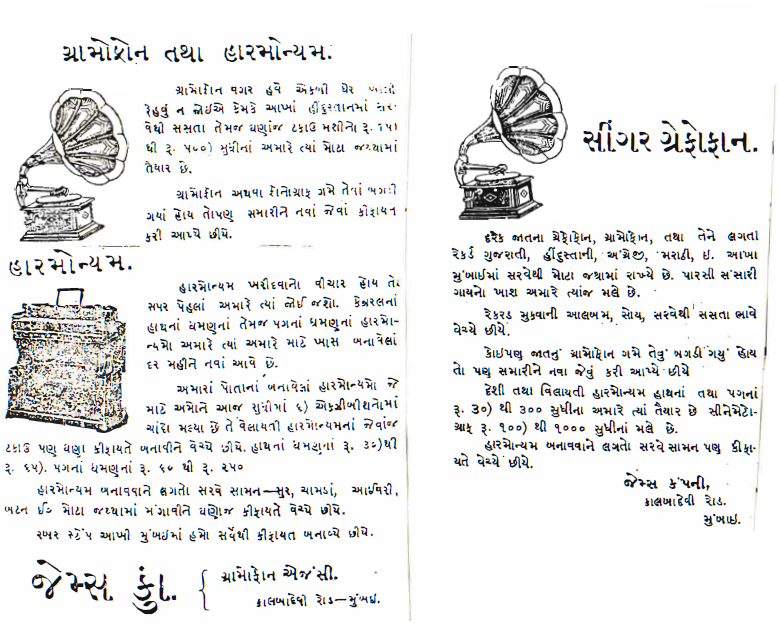 This first issue of the ‘PHON-0-PHONE’ disc record reached India in June 1908, with 115 titles, comprising – 75 Hindustani, 13 Gujarati and 27 Marathi selections. Between 1908 and 1914 it seems that the ‘PHON-0-PHONE’ label was dormant. At about this ti.me Valabhdas Runcbordas broke off his partnership with Lakhmidas Rowjee Tairsee, and converted the company that they had been in partnership with, Valabhdas, Lakhmidas & Co., – back to the original name of Valabhdas Runchordas & Co., and also took over The Talking Machine & Indian Record Co., as the Sole Proprietor. Along with the release of the ‘VIEL-0-PHONE’ disc record, The Viel-a-phone Co., Ltd., also pressed the ‘PHON-0-PHONE’ disc record using matrices that had previously been used to reproduce the ‘SINGER RECORD’. It is not known how many titles were issued on the ‘PHON-0-PHONE’ label – or if the reissues on the label extended back to those selections that had formerly been manufactured by The Wellington Cycle Co., Bombay. With the Favorite Record, A.G., Berlin being absorbed into the Carl Lindstrom, A.G., group of companies, the Singer Phono & Record Agency had lost access to the ‘SINGER RECORD’ – the remaining stocks of the disc records in their possession being brought up by Valabhdas Bunchordas. The Singer Phono & Record Agency was reformed by Nanabhoy J. Mody and Rustonji B. Lala, into the – Bombay Phono and General Agency, while still operating from 10-12 Kalbadevi Road. 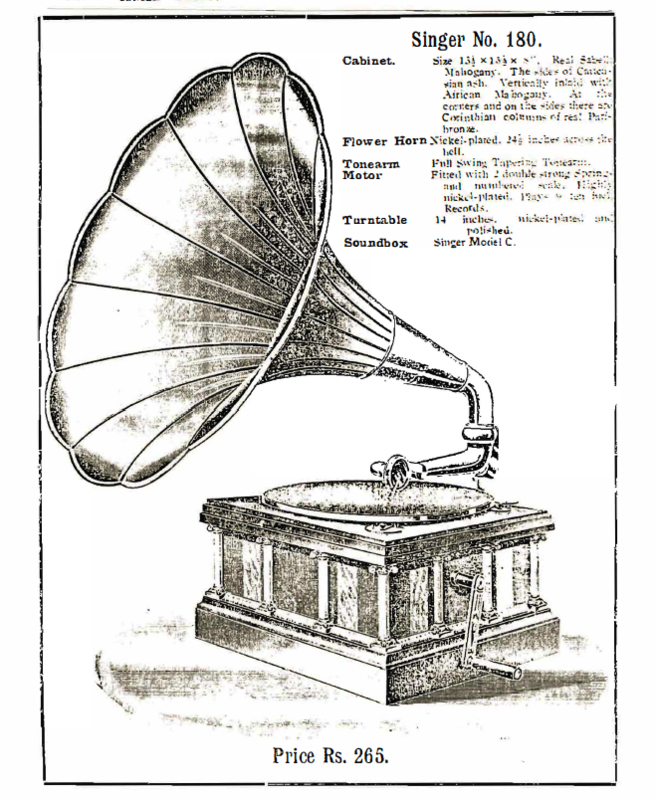 The Bombay Phono and General Agency described the firm as – agents and importers of gramophones and harmoniums and dealers in Indian and English records. 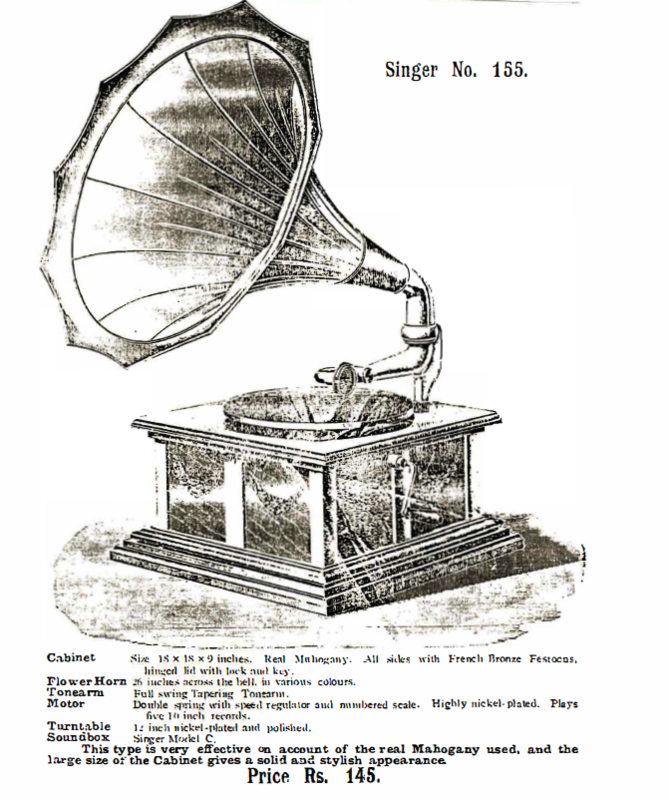 In 1910, the Singer Phono & Record Agency had introduced the ‘PRIMAPHONE’ range of disc talking machines to India and claimed to be the Sole Agents and Distributors of this line in India. 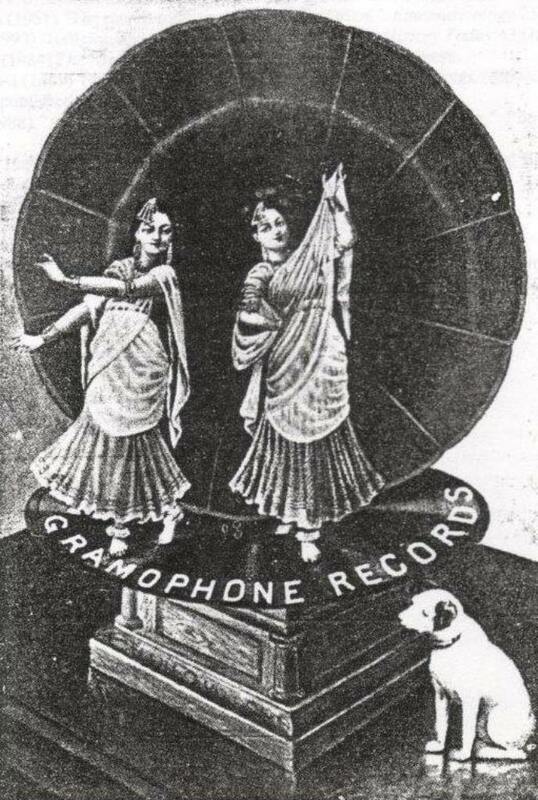 Although the Bombay Phono and General Agency were trading as ‘Gramophone’ dealers they continued to market the ‘PRIMAPHONE’ range of talking machines which were wholly imported, and became the primary sales line along with the ‘Motophone’ electric motors for talking machines. The hostilities of the First Horld (far caused great disruption to the talking machine trade in India, particularly for Valabbdas Runchordas, who in his several business activities had been reliant upon German and Swiss manufacturers and suppliers for continuity of his product range, even though he had a disc record factory at Mahim, and had for some time been assembling various models of talking machines using Indian made cabinets and sound horns. The James Manufacturing Co., continued in business, as merchants disc records, gramophones and harmoniums, but in the main reverted back to the making of rubber stamps and other requites, and although the main business had a strong and profitable life in music and sound recording products, the manufacture of the ‘JAMES OPERA RECORD – and ‘JAMES OPERAPHONE RECORD’ had basically ceased in 1914. In 1921, Hormasjee N. Mehta, who had been the driving force of the company died, and Byramji H. Mistri became the managing proprietor, and was soon joined in partnership by Jamshedji S. Surti. In 1925, Kaladevi Road, Bombay was renumbered with the effect that the address of The James Manufacturing Co,, was changed from 103 to 407 Kalbadevi Road, and another shop-front was taken at 422 Kalbadevi Road. During this period The James Manufacturing Co., also began to revitalize it’s business by the addition of a line of pianos. In 1929, The James Manufacturing Co., further diversified it’s business activities to that of Brass and Metal Stamp Makers, Stereo and Electro Typers, Photozincographers and Relief Printers. Byramji M. Mistri and Jamshedji S. Surti were joined in partnership by M.J. Surti and Cowasji M. Gobhai, and established – James and Company, at 30 Bruce Street, Fort, Bombay, as the main outlet for it’s piano, musical instrument, gramophone and record sales. Cowasji Maneckji Gobhai was also the Sole Proprietor of C.M. Gobhai & Co., Merchants and Commission Agents. By 1932, James and Company had re-located to “Navsari Building”, Hornby Road, Fort, Bombay. By 1937, Byramji M. Mistri, remained as the Sole Proprietor of The James Manufacturing Co., having been deserted by his partner, Jamshedji S. Surti. The partnership operating the James and Company, business had also been dissolved, with the company being taken over by it’s accountant, Phiroz Dhanjishaw Commissariat , about 1938. The James Hanufacturing Co., gradually gave up all association with the music and sound recording industries. By 1942, Byramji M.Mistri, had quit the musical side of the business and focused his attention on keeping the company going with office supplies only. After a few years of inactivity part of 407 Kalbadevi Road was ‘hived off’ to – The Britannia Talking Machine Co., a firm of record distributors whose head office was located at 184 Dharamtulla Street, Calcutta. Although the sign remained above the door at 407 Kalbadevi Road, there had been little activity there beyond 1970, and was considered a ‘defunct’ business by some of the neighboring stores. During the late 1970, the showrooms of James and Company, ‘Navsari Building’, Hornby Road, Fort, Bombay were also still being occupied – with elderly gentlemen keeping watch over a rather tattered variety of pianos – covered in thick dust – and a whole wall of old 78rpm disc records in their boxes – the shop had obviously done very little business for ‘some years together”. 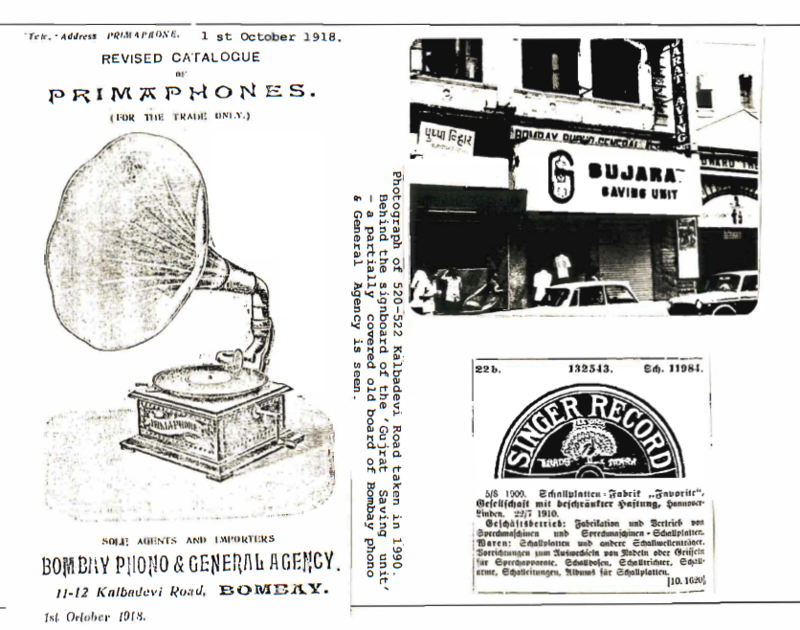 Bombay Phono and General Agency, along with The James Manufacturing Co., were for several years amongst the leading disc record and gramophone dealers in Bombay. Jamshedji S. Surti is reported to have severed bis partnership in 1942 with Nanabhoy J. Mody (who died in about 1945) and taken on Homi N. Mistry as partner. Eventually the Bombay Phono and General Agency passed into the hands Rustonji B. Lala’s son – Jal Rustomji B. Lala and a Hr. Jamnadas, who is said to have been connected with or a partner of The Britannia Talking Machine Co., but after some years the Bombay Phono and General Agency had virtually ceased trading and disposed of their disc record stocks to the traders in the Chor Bazar. By about 1972 the store at 520-522 Kalbadevi Road had been sold off to the Gujarat Savings thus ending another important chapter in the annals of the sound recording industry of India. 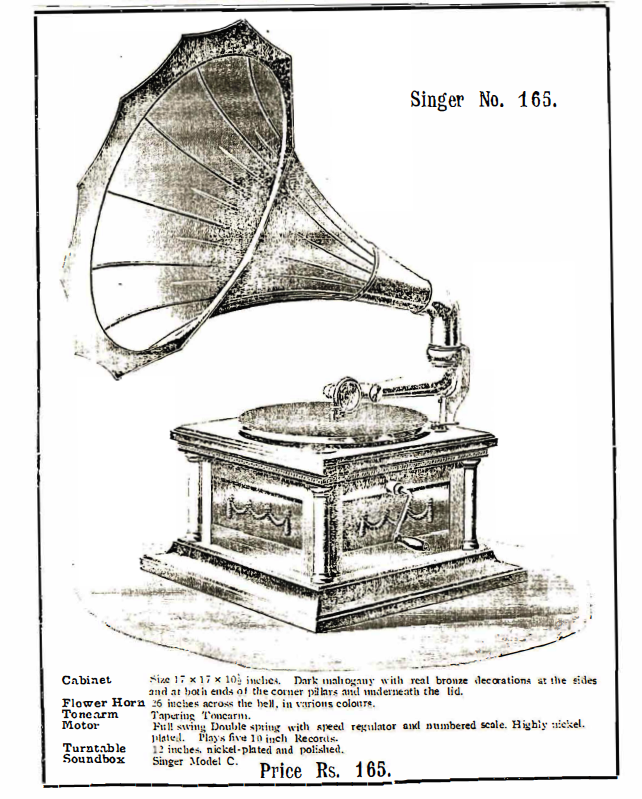 Some aspects of the history of the ‘SINGER RECORD’ and the ‘JAMES OPERA RECORD’ related in this article were previously published in – The Talking Machine Review International. No.70, December 1985, (pages 1993-1996) (published: Bournemouth, England). Thanks to Suresh Chandvankar, Bombay, and Rantideb Maitra, Calcutta, for contributions to the article. As a supplement to the main article I have included an article on Mahomed Hussain (Naginawale) – whose recording career had a very distinct bearing on the activities of the two labels described above. This entry was posted in INDIA and tagged Beka Grand Record, James and Company, james opera record, Michael Kinnear - Discographer, Michael Kinnear- Researcher, Schallplatten-Fabrik Favorite GmbH, singer record, the james manufacturing coy, The nTalking Machine and Indian Record Co, the wellington cycle co, Valabhdas Lakhmidas and Co, Valabhdas Runchordas by bajakhana. Bookmark the permalink.